You know what your customers are doing, but do you know why? Web analytics give you a snapshot of what is happening on your website, but they don’t give you the full picture. Foglight User Experience Management from Dell enables you to record every step of every customer’s visit to your site – every mouse click, every page view and even what they added to their shopping cart. Now, you can track customer behavior, see what they see, and identify areas of concern without the added time and expense of trial-and-error troubleshooting. 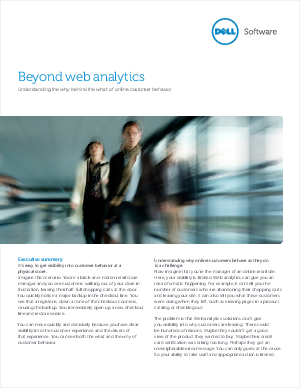 Download Beyond Web Analytics: Understanding the why behind the what of online customer behavior and see how Foglight User Experience Management can help your business better understand your customers’ online behavior and increase customer conversions.